Okay. I have a reputation for not wanting to share my piano. I admit to being, at times, possessive and even getting angry or sulking when someone forces me from the bench and I have no choice but to take on the role of casual observer for however brief a period. Enough already. It’s been reported before in the media. Frankly it’s old news, as far as I’m concerned. But Burnell and Betsy seem to think it somehow cute. Strange, those humans. So, when Ronnie was here today for her lesson and she sat at my beloved Yamaha, Burnell snapped these photos of my reaction. I’ve allowed them to be posted here because, to me, they represent something other than a possessive and unhappy cat. 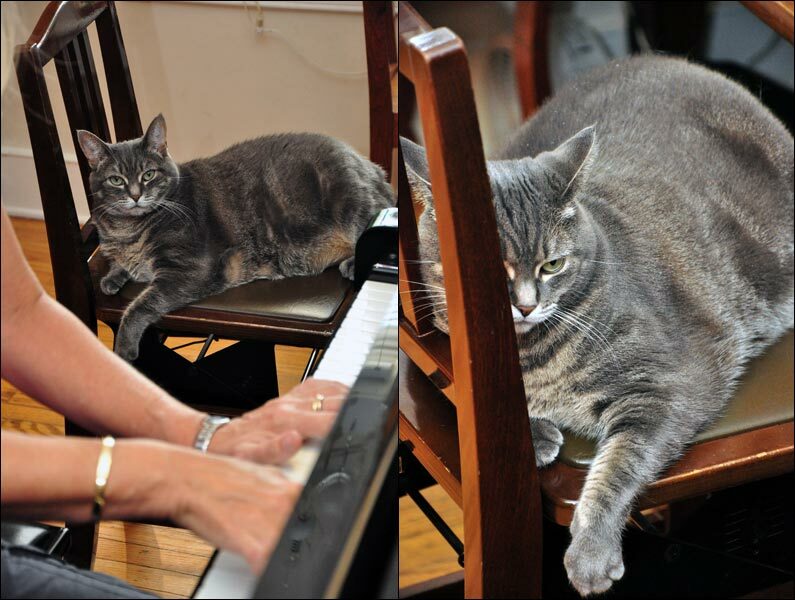 My dear friends and fans, these photos reveal a cat who is so passionate about her music and her instrument that she finds it hard to be away from it for even a moment. I am not a feline who is content to remain on the sidelines. I am not a layer, but a player. And I make absolutely no apologies for that. And I don’t blame Ronnie for wanting to play on my piano. Who wouldn’t? But let’s get real here. I have thousands of fans (Billy Joel is among them) and my own website. Can she say the same? Click image to view larger. Not only that, Nora, but I am sure you can play MUCH better than most others who sit at your Yamaha! The Nora Magazine: Promise of the Future?